Toshiba 40TL963 review | What Hi-Fi? 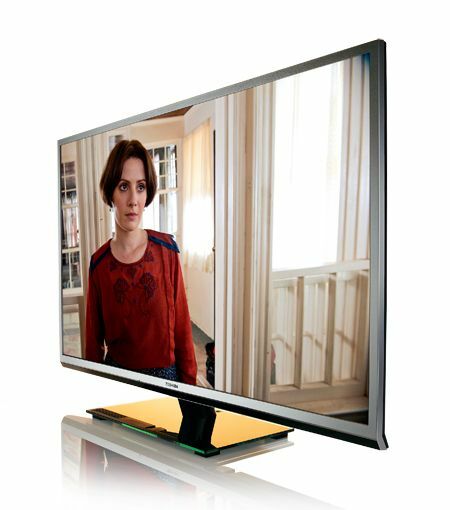 At £550, this Toshiba 40TL963 40in TV is cheaper than many direct rivals. But don’t let that fool you into thinking Toshiba has scrimped on features. This set is fully kitted out with internet-enabled smart features, has four HDMI ports and two USB ports, Freesat and Freeview HD tuners, and active 3D. Toshiba Places is where you can view online multimedia content, and the media hub is organised into categories for TV, Movie on demand, Music, Social Place, News, and Games/Apps. Along with the now-standard BBC iPlayer and YouTube, you can also watch movies via Acetrax and view pictures from Flickr. You can make different accounts in Toshiba Places for different users, making the smart experience customised to your personal settings. You can connect your TV to your home network via wired or wireless connection to pull up images, music and videos stored on external devices. You can also plug memory sticks into either of the two USB ports. Files supported are JPEG pictures, MP3 and MP4 audio, and DivX+HD and MKV videos. WAV files are not playable. Active-shutter 3D glasses aren’t included, but you can buy them online for around £45 a pair. This is a good-looking set, with a thin grey bezel surrounding a screen that turns at a convenient angle on its stand. It also comes with a rather large remote control, as well as a smartphone app. Setting up the TV, however, is more of a struggle compared to rivals from the likes of Sony, Samsung and Panasonic. We always use a THX calibration disc for optimising the picture, but even after that we spent a long time fiddling with the brightness and contrast levels to get a more satisfactory picture. The contrast on this set is not strong enough for colours to make an impact; dark scenes are swathed in murky shadows that overwhelm subtle details. Brighter scenes such as those in daylight fare better, and you can appreciate the clean and decently detailed picture, especially when watching standard-def daytime TV. The colour balance is on the lean side, and this lack of enthusiasm gives a dulled picture even with high-definition Blu-ray pictures: details blend into the background as edges between objects aren’t as clearly defined. Skin tones aren’t as natural looking as others either. A more overriding issue is the LED backlighting, which struggles to be uniform. There are splotches of uneven backlighting that clearly permeate the screen and affect what you’re watching. Watching DVDs on this set, on the other hand, is a much more pleasant experience. We put on Luc Besson’s Leon: The Professional, and when upscaling to 1080p the TL963 is capable of delivering clean and smooth images that are decently detailed. The contrast issues are still there, but still, it’s good news for those with a more DVDs than Blu-rays in their collections. Toshiba 42VL963: VerdictThe bargain price means this set could have been a four-star product like its big brother the Toshiba 42VL963, with its decent standard-definition viewing and spread of features, but the backlight issue has to knock it down a star.